Hi friends! 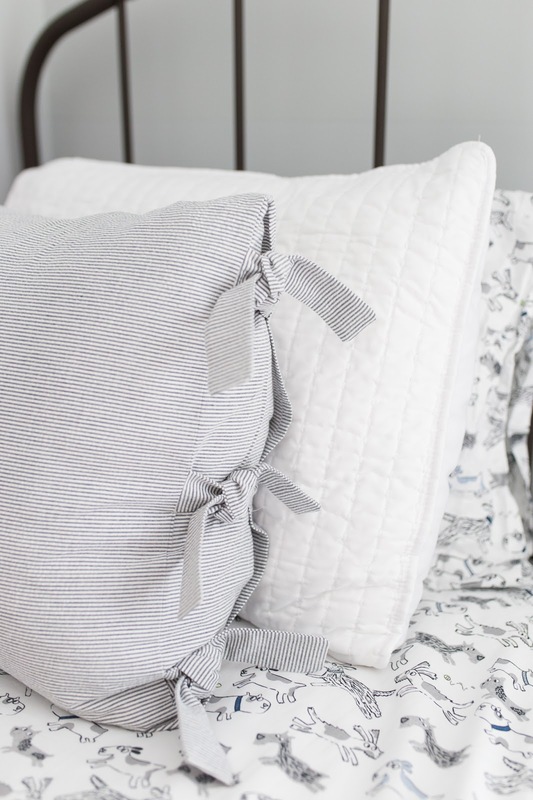 I posted a photo of this easy DIY pillow with side ties on Instagram and had so many requests for a tutorial, so I'm excited to finally share it with you today! Its been way too long since I last had time to share a DIY project, which was always one of my favorite posts here on the blog, so its fun to finally get back to it! Bear with my meager Photoshop skills though because I didn't take photos of each step since I wasn't sure if I'd be able to pull it off! 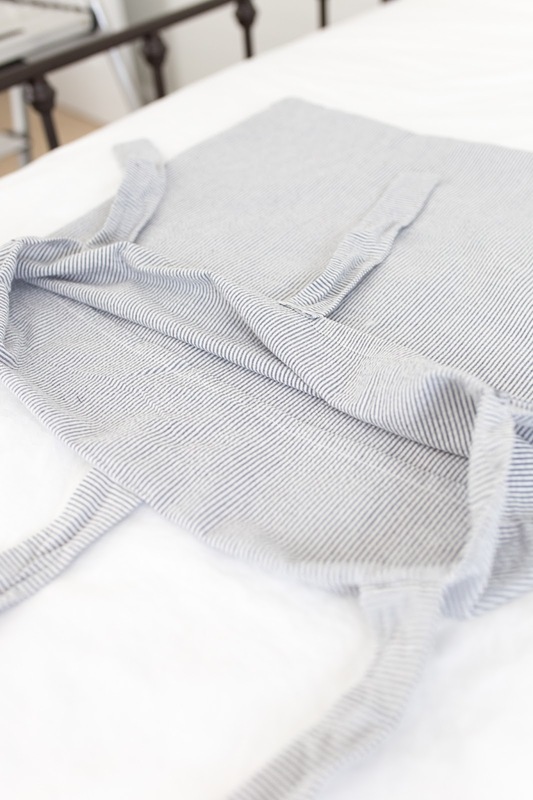 All you need is a sewing machine and basic knowledge of how to use it, a pillow case (preferably that has an envelope closure), and about 30 minutes to spare. This black seersucker pillowcase was a standard size pillowcase that came with a twin duvet set I ordered for Rowan's big boy room. 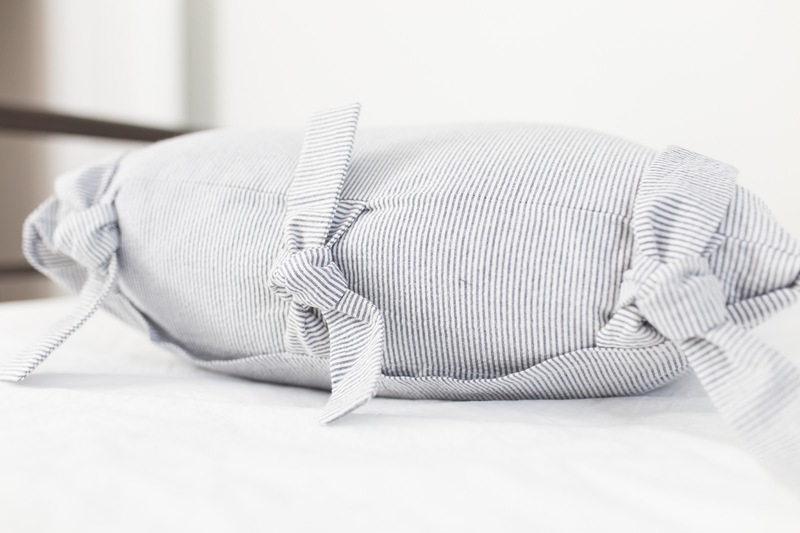 I was lucky that it already had a flap to hide the pillow on the open end, which is basically an envelope closure, so I didn't have to add it myself. 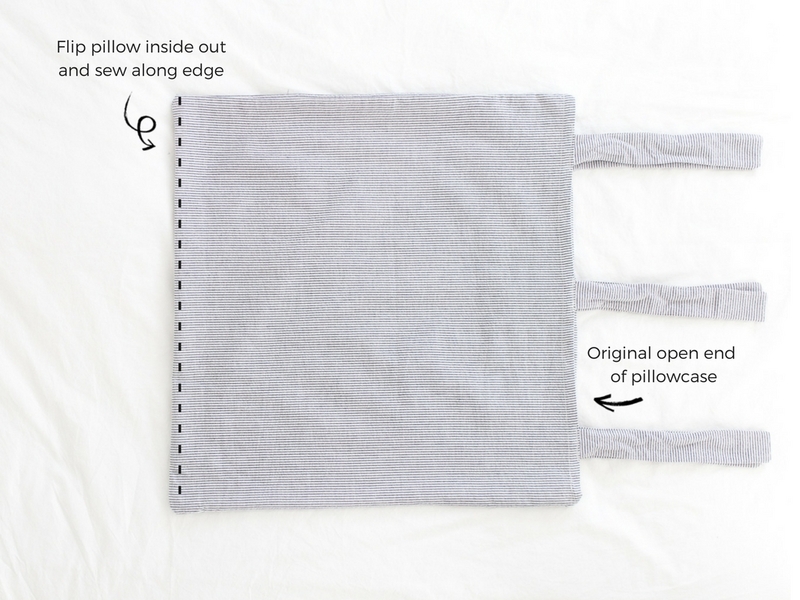 If you can't find a pillowcase like this, its not totally necessary because you'll still be tying it closed, but I personally like having the extra fabric there to hide the pillow insert completely. 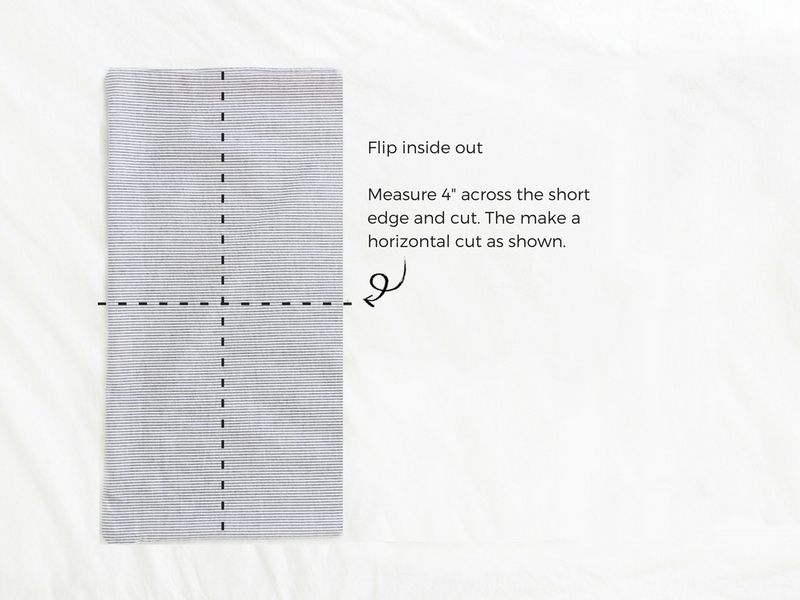 First lay your pillow case out and measure the short side. Mine was about 19.5" which was perfect to make a 20" square pillow. Measure the same distance along the long side, in the opposite direction of the opening. So basically you want to leave the opening the way it is and create another opening on the other side (we will sew this end shut though, so stay with me). In my case it was 19.5" + an inch for seam allowance, so mine was 21.5" in length. Cut and then put the larger section aside. This is by far the most time consuming part of this project - making the ties. Take the smaller section of fabric you have left, turn it inside out, and measure roughly 4 inches across. Make two vertical cuts as shown below, then one horizontal cut. 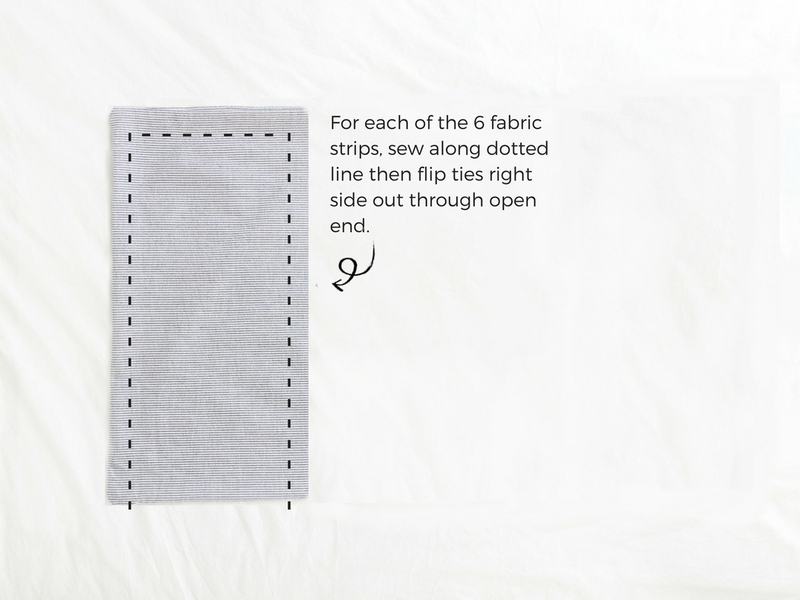 This will give you 8 pieces of fabric, but you only need 6 for the ties. 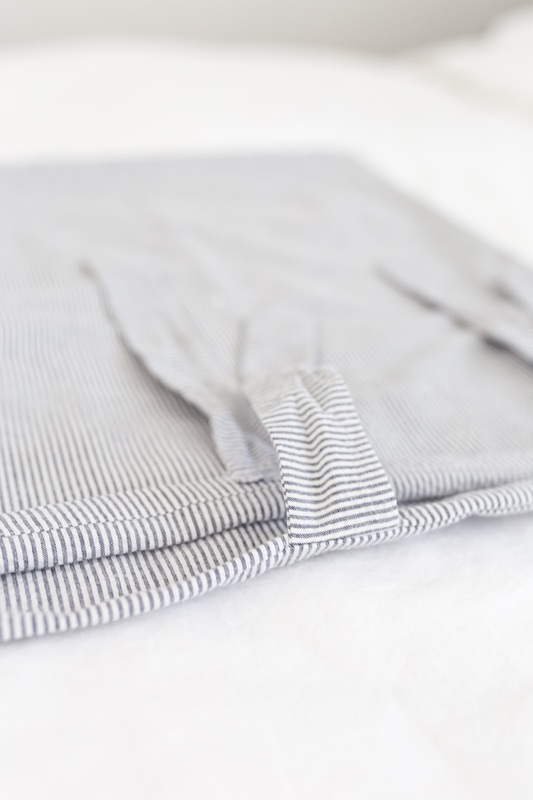 Fold one piece in half lengthwise and sew along three sides. After folding and sewing, your finished tie will be roughly 1.5" wide depending on how much seam allowance you gave yourself. 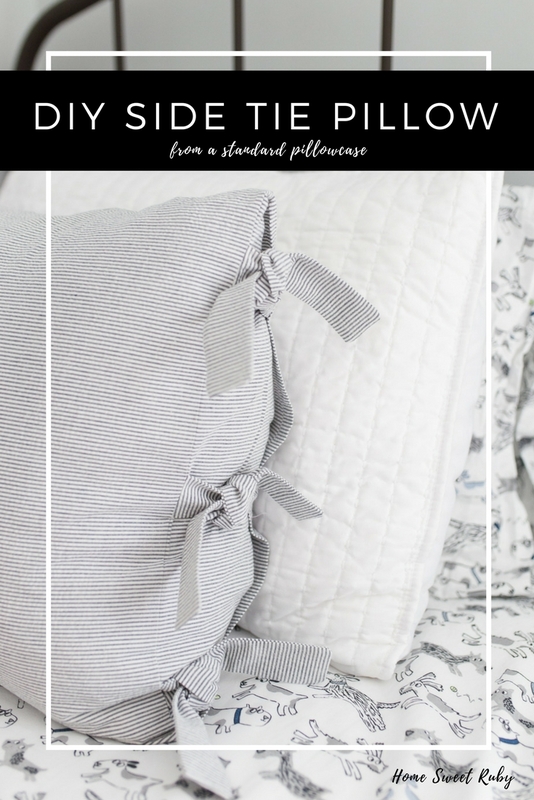 Once you've sewn three sides of each strip and flipped them right-side out, its time to attach them to the original opening of the pillow case. I wasn't very analytical about attaching them to the pillow case because I knew my littlest was about to wake up. So I just stitched each of them on after carefully measuring and pinning them in place so they don't move. 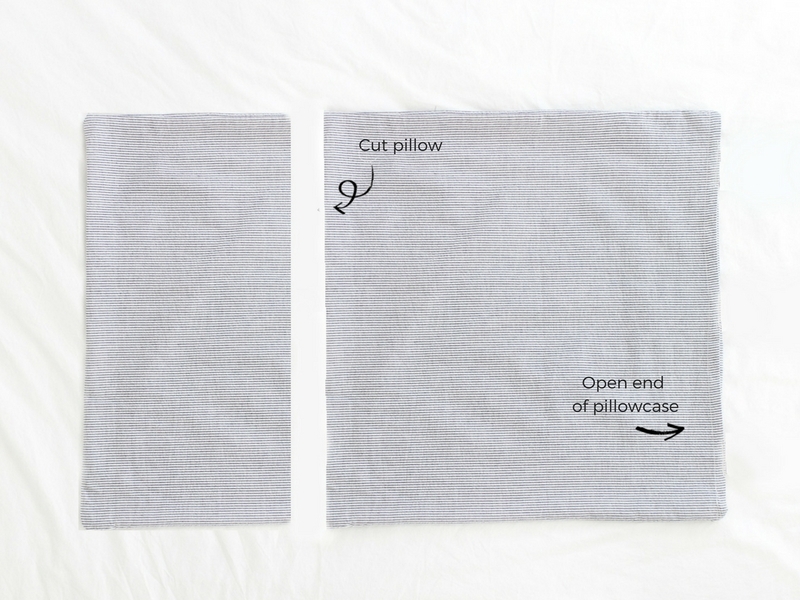 Finally, sew the pillow case closed where you made the initial cut. 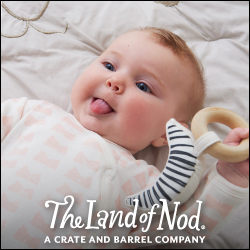 I promise its not complicated, the ties just take a few minutes and you can watch Netflix while you flip them right side out! Let me know if anyone has questions, hopefully this was helpful!